What kind of p​ower rack should I buy? This is an overview of options for someone who is just starting out to buy a home gym for their garage, attic or basement. It is mostly geared towards individual users rather than gym owners. You will find links to relevant providers of material and tips for setups. How do you want to store your plates? Decide first which one of these goals takes priority for you before choosing your program, diet, and equipment. Otherwise, you will be wasting time, money and effort by traveling down paths which do not take you to your desired results. 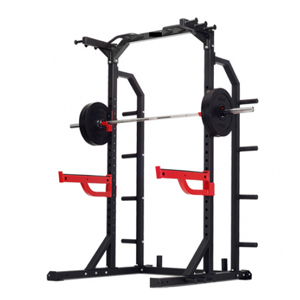 If you are in the market to buy a power rack one of your main priorities should be to improve strength performance. If you are considering to lose some surplus pounds after Christmas season, a pregnancy or after you moved out of the home and got out of shape at university it might be too early for a power rack. For this goal pick a program like Jo Wick’s Lean in 15 or Bikini Body Mommy and buy some dumbbells from the local grocery chain to do them. Maybe invest the money you save in a Garmin watch to do a couch to 5K program. 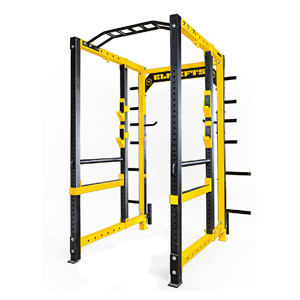 For all the footballers, rugby players and general strength addicts out there who waste time in the gym waiting for someone doing their biceps curls in the power rack and who have some space left in their garage or attic, an investment in a power rack might just be for you. If you are about to build a new professional gym for your school, university, team or spa same rationale applies. Think about the goals and plans of your ideal clients first and pick the equipment you buy according to their needs. For you, the strategy and planning phase becomes even more important as it has a bigger impact on your purse. Your budget will be most likely the limiting factor to what you can do. Racks start as low as 150€ with no top ceiling depending on how many accessories you buy and which brand you get. Expect to spend somewhere between 500€ to 5000€ for a proper setup. For most people that is a considerable investment. This is the first step to generally see whether you are in the market for a power rack or not from a budgetary perspective. The most important bit is the next one. 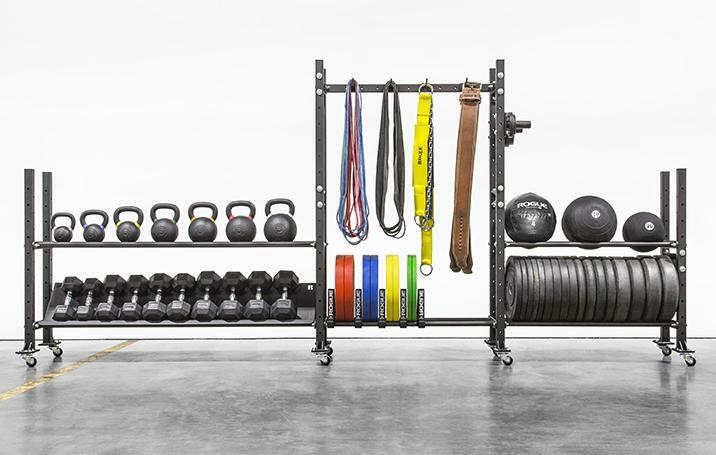 Exact measurements are key for buying a power rack. Consider the floor space you have. Measure everything and also get ideas from the internet on how you can lay out your storage and access. Think of safety and have some room around your rack. Make sure you measure the height of your ceilings. There is nothing worse than ordering a rack for your good money which you have to saw into pieces before even using it because you got the dimensions wrong. The height becomes especially important if you want to be able to do pull ups with your rack. You would usually struggle to get this setup comfortably done in a garage or attic. Squat stands are the less costly option to get started with your home gym. The advantages of the squat stands are that they are easy to transport and setup in any place and the leftover budget for other things like a bench or some plates. The challenge with squat stands is that you have no possibility to attach safety, work with bands and there is a lot of room for setting them up improperly. In my opinion, squat stands are ideal for experienced lifters who know their limits, how to set up for success and de-load a weight securely. 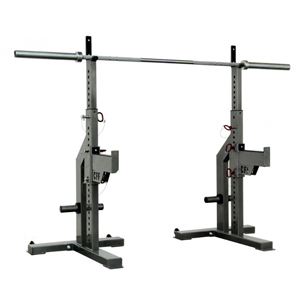 Most garage gym users won’t have space or experience to work securely with squat stands. Leave that to the professionals who have coaches around at all times. Wall Wall mounts mounts are the next better option as they do not take up a lot of space. The fact that they will be attached to a wall also minimizes the possibility for an insecure setup. 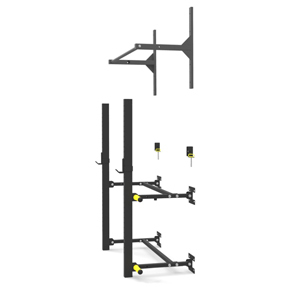 Compared to a full rack you will be limited to spotter arms for your safety setup. This is still better than with squat stands, but if you fail a rep there is a higher chance that you will bury yourself under the weight as it bounces off the spotter arms and from there anywhere. The space to store your plates will also be limited and you might have to buy an additional piece of equipment for this purpose. Power Racks are in my opinion the most suitable option for a home gym owner who is serious about barbell training. Expect an investment between 500 – 2000€ for a good setup. The big advantage of power racks is safety. You can use safety pins or bands to keep yourself secure and avoid injury without having someone around to spot you. Watch out for racks which have small increments between the holes in which you can place your cups and other pins. This usually leaves you with more options for your setup. From a transport perspective also take care whether the rack comes in one piece or not. If it comes in one piece make sure that all the doors and süpaces it has to go through in your house are wide and high enough to fit the rack through as you are not able to disassemble it like IKEA furniture. Rigs are the “be all end all” for multiple users. If you own a gym this is the option to go for to get as many athletes as possible to train at the same time and make the most use of the available floor space. As you will most likely be spending an amount which is north of 10,000€ get in touch with the sales rep of the vendor and get some help with your purchase. They will gladly help you to be happy with a big shipment. Depending on your available space you might want to consider different ways on how you can store your plates. For home use, I would always advise some good value bumper plates. Metal plates usually leave nasty marks on the floor when you drop them. Bumper plates are more forgiving. Avoid the competition bumper plates unless you have the budget and care for aesthetics. 100kg are 100kg, it does not matter for the average user whether they are competition plates or not and this will save you a good couple of hundreds which you can invest in something else. With no barbell, no work will be done. The essential items for your serious home gym are the barbell, the rack, J cups and safety pins. I personally have used Eleiko, Rogue, and York bars in the gym. York seems to be very popular in Ireland and the UK. 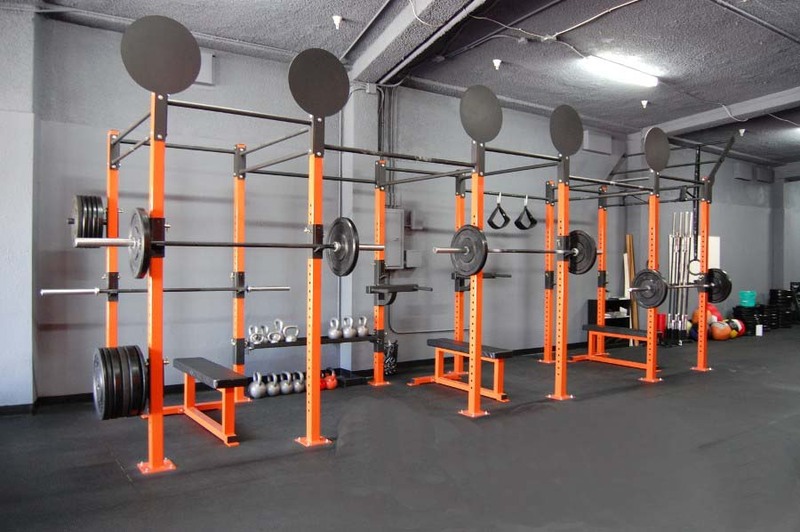 While I can see the appeal of this option for gyms who have to buy 5 to 20 barbells at a time to save 50 – 100 each, for your own home gym you might want to invest a little extra and go for a mid-range option. 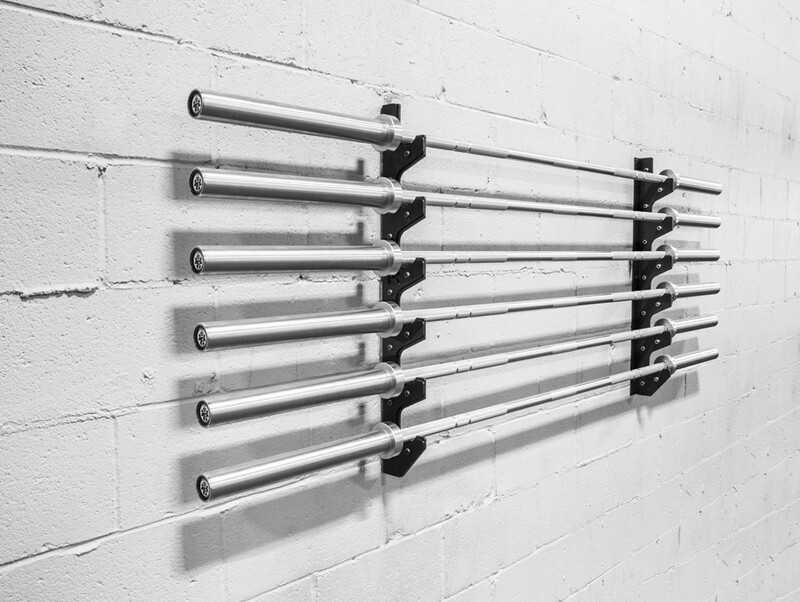 Good barbells should cost you around 300 – 500. Whenever I had the chance to work out with a rogue barbell I was in for a happy day. The Eleiko option is the upper range barbell and is in my experience a bit overpriced for a home gym. If you ever walk into a gym that has Eleiko barbells only you know that they are serious about their lifting. If you are the only one using the barbell at home I am quite confident that you will get a lifetime's use out of an Eleiko or Rogue barbell. With what I have seen with York bars you might have to buy two over a human lifetime. If you are considering a power rack purchase it is quite fair to assume that you are serious about lifting. Therefore your shopping list should include a good bench to do movements like bench presses, single arm rows, and other exercises. A bench usually comes in between 100 to 500 euros. Take care to look at how the bench is built. There have been cases in which people have been impaled during bench pressing because the structure of the bench gave in. Saving here might be saving on the wrong end of things. Whatever your budget, your floor space planning is key in getting the right equipment for yourself. Rather than spending hours on the internet searching for the best deal, spend a couple of hours or even days to understand your needs, available budget and how to smartly use the space you have. This will go a long way in your purchase because the money that hurts most is what you have to pay twice due to stupidity.